I write novels, for children, about magic, set in Scotland. My novels are – of course – fiction, so I could just sit at my desk and make them up. I like to weave authenticity into what I write, through the traditional tales and landscapes that inspire me. I use real landscapes partly because I want the children who read my books to feel that adventures could happen in their own local areas. I also hope that even readers who don’t know a particular coastline or moorland, or a particular folktale, will find an authenticity in reading about something real and possibly subconsciously familiar. But the main reason I use real landscapes is because I get ideas for plots and character by walking the land and engaging with the old lore connected to it. My first series of adventure novels, The Fabled Beast Chronicles, were set in locations all over Scotland, using characters and magic from many Scottish stories mixed with stories from all over the world. However the principles were the same in both series. I chose to set stories in places that feel magical, places that have already gathered lore and stories around them over centuries. I set a fight scene in Smoo Cave in Sutherland and a break-in at Dunvegan Castle on Skye, I set an ambush at Dunadd in Argyll and hid a clue at Tam Linn’s Well in the Borders. It’s easy to imagine that magic could happen in these places now, because we know that people believed magic happened there in the past. These locations have an authentic sense of story and adventure. I don’t expect many of my young readers to know all of these places or the stories associated with them. Some readers might already know their local folklore, and I’ve been delighted to discover that some readers explore new parts of Scotland and new (to them) folklore after reading my novels. But I believe my fictional characters react more powerfully to the locations they’re chased through, and the dangers they face, when I can ground my new magic in authentic tales of previously imagined magic. However, I don’t set all my scenes in real named places. For example, I never let my characters live in real towns or villages, because I often need to move buildings or farms or rivers around a little bit to facilitate chases and quests. But I also don’t want any younger readers to worry that there’s a villain living next door to them! So I invent place names by cutting real local place names in half and sticking them together in new ways. Clovenshaws in the borders, Taltomie on the north coast, Craigvenie in Speyside (a very thinly disguised Dufftown – my own childhood home town.) But even though I invent their names, my characters’ home towns are based on real places, so I try to make the surrounding landscape feel appropriate for that part of Scotland. When I visit a location I’m planning to use in a novel, I don’t draw many maps or sketches, or take any photos. I reckon that if I can’t describe the place in words when I’m standing there looking at it, I won’t be able to write about it when I’m sitting at a keyboard in my study. Describing a landscape accurately and evocatively may involve repeated visits at different points in the writing process, and returning at different times of year to see the colours of the landscape change. But I don’t just visit locations to make sure my description is accurate. I also visit locations to ask the landscape questions. Practical ones like ‘could a dragon land on the top of that hill?’ and ‘could a kelpie in its monstrous underwater form fit comfortably in that pool?’, but also more story-shaped questions like ‘what might be lurking in that shadow?’ ‘how would it feel to be chased across here?’ and ‘where could you hide?’ Those questions lead to the scenes that I write. Those questions, and the answers I scribble with cold hands in rain-spattered notebooks, would never appear in my head if I was looking at google earth instead of standing on the land I want to write about. But most of the magical characters in my books are inspired by Scottish traditional tales, for example the selkies, the blue men and the child-stealing fairy queen in the Fabled Beast Chronicles. And the entire plot of the Spellchasers trilogy was inspired by snippets of stories from the North East of Scotland about witches transforming into hares, or turning other people into hares. The idea of becoming an animal which is elegant, powerful and incredibly fast, but also very vulnerable, inspired a plot about a girl, Molly, who is cursed to shapeshift into a hare at inconvenient times, and who goes on a curse-lifting workshop. Because the story was inspired by lore I read in the wonderfully titled Primitive Beliefs in the Northeast of Scotland by JM McPherson, I decided this was my chance to set a story in Speyside, where I grew up. The stories I found in Primitive Beliefs, and other source books, also presented me with a problem. I was inspired by tales of witches and shapeshifting, hares and curses. But I was also disturbed by them, because some of the women I read about were real people, who had been accused of witchcraft, tortured, and executed. I visit locations in order to get my facts right, but also to ask questions that prompt new plotlines. And I visit the old tales to gather details which add authenticity to my novels, but also to be inspired to invent new magic. I ask questions of the landscape; I am prompted to ask questions by the folklore. I love the imperfections of traditional tales. I’m not frustrated by the lack of detail and the flat characters. I see them as opportunities. Those gaps give plenty of space for new stories. Traditional tales rarely dig deep into motivations, often presenting the most bizarre and reckless decisions as simply the next step in the story. Characters in traditional tales are often lists of attributes and actions, rather than fully realised people (or monsters!). When I take those questions outside with me and ask them in a landscape with a history and tradition of stories, that’s when my own novels start to take shape. So now the Spellchasers trilogy has been published, and I’ve answered most of my questions about shapeshifting lore in the North East, I have a story growing about landscape and lore even further north. So this November, I plan to wrap up warm, lace my boots and head to Strathnaver, to ask a few questions, glimpse a few answers and perhaps build a new story. 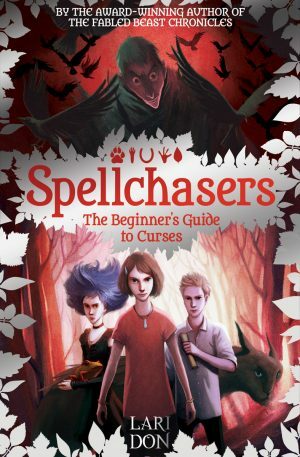 The Spellchasers trilogy by Lari Don is published by Kelpies. Lari Don is an award-winning children’s writer and storyteller, brought up in the North East of Scotland, now living in Edinburgh. She has written thirty books, including adventure novels for eight- to twelve-year-olds, retellings of traditional tales, picture books and a teen thriller. The essential tools of her trade are lots of notebooks, a pair of walking boots and a library card. If she isn’t on a remote shoreline, you can often find Lari on Twitter @LariDonWriter, and you can find more info about her books on her website www.laridon.co.uk.